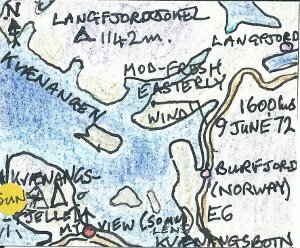 Although still quite sunny, it was still cold at any altitude in early June at 70 degrees North in Northern Norway. There were snow patches down to sea level at this latitude, and we take green grass for granted in England, because, here, it only grows at low levels for 3-4 months of the year, and that only happens near the coast. By late afternoon this particular day, there was increasing cloud forming in a strengthening easterly wind as a "lee depression" began to develop over the warmer waters offshore. Kvaenangen is an inlet midway between the Lyngen Alps and Altafjord, the E6 road suddenly giving a most breathtaking view from south to north towards the glacier of Langfjordjokul. This glacier was marked on the Norwegian Tourist Board map or 1971 as being 1142m (3748ft) high, after some cold winters during the 1960s, but on the Michelin Motoring Atlas of Europe, Langfjordjokul had retreated by 1996 (25 years later), to a reduced height of 1064m (3492ft) after a run of milder Winters and warmer Summers.